Guest Blogger –My cousin Warren Ebbinghaus of Traverse City, MI. We, as the Ebbinghaus family, were introduced to Trail’s End by our Grandfather, Willard R. Ebbinghaus, around 1947 to 1948. We all came north into Michigan from Dayton, Ohio. Grandpa was moved by General Motors to Lansing as an Engineer for Oldsmobile. He would go further north exploring every chance he had. He finally left GM bound to find work “Up North”. He found work in Traverse City. He worked there as a foreman in a large Tool & Die Co. He drove to Traverse from Trail’s End, every work day until his death. I have vivid memories of the cabin being built. I was six and my brother Jim was one. We watched my Grandpa, our Dad and uncles stripping the bark from the logs to set and cure for the future building. The finished cottage was beautiful: natural pine logs with white caulking and split pine for the interior walls. Grandpa even built his own beautiful stone fireplace. I remember the stones and interior like the back of my hand. As they started building they tried to all stay in a large tent, that didn’t work well, so Grandpa bought the white cottage nearby. It was small but adequate and was used afterwards for over flow from the log cottage. This was all pre-national park. After he passed there was no family close enough to maintain the logs and caulking so it was sold. The new owners did not buy the white cottage so it went the way of other structures, after being taken over by the Park Service, and torn down. The red cottage you see to the left was the cabin my grandfather built. The new owners encased the log cabin with siding for ease of maintenance. Losing Grandpa’s cottage was very sad for me because I think I had the best memories being with him. When I was in High School I would call Grandpa and tell him I would be coming out that night to go fishing. I would get there about 10:00 PM. He would be snoring in his chair and I would have to wake him. He loved it anyway, late or not. We would take the boat out in the dark to our favorite bass beds. Using a black jitter bug we would cast into shore, hoping not to get into the weeds. I would start cranking in the bait and all of a sudden a bass would hit it and fly out of the water. It was very exciting! Getting back to the history of Trail’s End, one thing I always wondered about was why more people hadn’t sought out this gem. As you drive down the trail the first house you see sits back to your right. That is the Gibheart’s place. That property was grandfathered and allowed to remain and is still owned by the family. Next you find Otter lake also on the right. To my knowledge, there were only four cottages ever built on Otter. Next you go over the outlet running into Otter and to your left is Bass lake. When this area became part of the National Park System all the structures that were not grandfathered where torn down. Hence you won’t see the little white cabin next to the red cottage which was once my grandfather’s cabin, nor another landmark: Vincent’s Lodge. Bass Lake had a little more going on. I remember in the 1950’s, just right off the dock to the west, was Vincent’s Lodge. The lodge sat just back off the beach, behind it was six cabins. 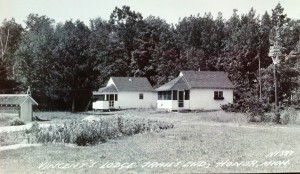 The Lodge had a dining room, but guests could cook in their cabins, as well. I remember smelling the cinnamon rolls and fresh bread in the morning so I would have to go over and say good morning to the cook, hoping she would offer me something fresh out of the oven. Man could she cook! Anyway the Lodge finally expired in the late 50’s and was torn down by the Park Service. The beach by the dock was all man made. Mr. Vincent got many complaints from his customers that the kids had no place to sit and play in the water, so after years of sand being hauled in, you can still see the remnants of a beach. At Trail’s End there are three lakes making up the chain, all spring fed. 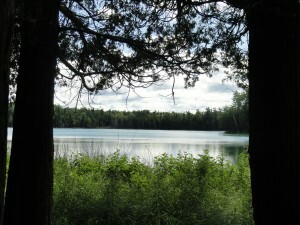 Deer lake sits to the extreme south east corner of Bass. There is a very shallow water way to get into Deer, unfortunately it is often blocked, but a portage could get you there. It’s incredible. The lake is probably the size of two football fields side by side. The water is black. My dad and uncles always said they didn’t think it had a bottom. There were some lunker pike in there “back in the day”. A short fish story: My Uncle Ross and I were “still fishing” in Deer Lake with sucker minnows and I got a strike, I started reeling it in. I had a 14″ pike on my line. I got him about half way out of the water and then a gigantic pike came up out of the water and grabbed my little pike and slashed its body in threads. Needless to say I about jumped out of the boat, but with a second thought I decided I’d rather stay in– it was safer. A true story, where’s the camera when you really need one? At the right of the dock on Bass Lake; over to the corner and up a bit has always been a great crappie and sunfish hole. Bass lake had mostly pan fish, bass and pike. Otter had perch, pan fish and pike. Deer Lake had mostly pike. Trail’s End is a gem in the wild and anytime you get a chance to explore you should. 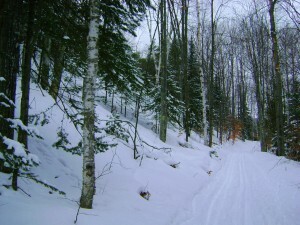 It has some great cross country skiing and hiking trails, as well. As you leave the Bass Lake parking lot, to your left the trail is gated to keep out motor vehicles. There is a trail that follows the Lake Michigan bluff line that goes north to Otter Creek or south to a Back Country Camping area and on further south through Platte Plains. If you head toward Otter Creek and Esch Road, look to your left towards Lake Michigan you can see a very large tree, which is called the “hanging tree”, but that’s another story for another time.As a final note, there is a way to get intoDeer Lake by hiking. As you turn east to head back to M-22, you pass over the connecting creek between Bass and Otter and you will see a white cottage to your left and a two track hiking trail that winds back to Deer lake to your right. 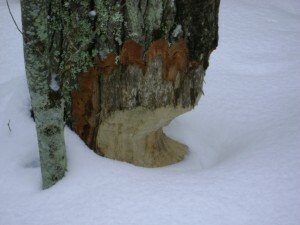 Every time I have gone back there I have seen fresh beaver cuttings. Once you get to the lake, you can walk a short distance to get a full view of the lake. As you can see, Trail’s End is a paradise for all seasons and many forms of recreation and a wealth of memories.